This is the story from the trip we made to the Monastic State of the Holy Mountain. Pt I is about what we tasted before entering the autonomous state. Day 1: Following a four hour driving from Athens, our first stop was planned for Litochoro, a beautiful village just under the foot of Greece’s highest mountain, Olympus. It was into this majestic scenery, where Andreas Gavris, a -relatively- recently well respected chef, had already made a multi-course lunch for us. The pleasant surprise, were the wines and spirits kindly offered by a dentist in profession, Lefteris Rizos. A well-educated and passionate amateur winemaker. He produces a fine multi-varrietal, dual distilled spirit (Tsipouro) full of anise, mastic, coriander and fennel aromas. It made a perfect match with traditional (but well modernized :)) Greek starters such us Octopus, cuttlefish & wild mushrooms. 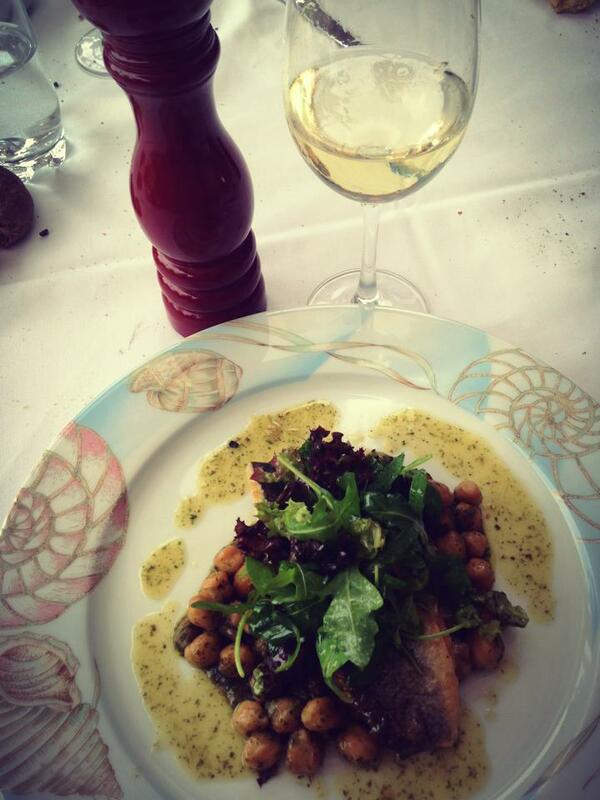 The flavors and smells of Greece: sea-bass, chickpeas and fresh coriander. Paired nice with Lefteris’ white. Next in line, a top rated dish of Andreas, made by sea-bass, chickpeas and fresh coriander, full of flavors and smells of Greece. Matched by Lefteris’ white blend of three indigenous grapes: Malagouzia, Assyrtiko and Savatiano, fresh, highly aromatic with decent acidity. Last dish, a finely cooked lamb with the company of the red wine, made by Cabernet, Merlot and two indigenous grapes: common Xinomavro and uncommon for Northern Greece, Mavrodafni. Next stop, to the beautiful town of Katerini. It was there, where Alex Sakkas had planed an introduction to wine tasting and food pairing to local audience. The concept was about two of the most well known Greek wine regions: Santorini and its Assyrtikos, as well as Naussa and its Xinomavros. The event was hosted by a young, but very talented chef Kostas Aivazoglou, at Apolafsi restaurant. Feeling proud for those top wines, we left for our hotel, full of expectations for the day to come. OK, not the most exciting story you’ve ever heard so far, but trust me, and stay tuned for Pt II where we enter the Autonomous Monastic State of the Holy Mountain, visiting Tsantali wines. I loved it! Looking forward to Pt.II and an insight on Tsantalis!!! Stay tuned Greg. It’s a place made by “divine” materials!